News from down under: the TRUE skeptical women side with the guys! Let’s ignore the “no true skeptic” for a brief moment here, and the fact that the two women replying both strongly disagreed — and that the poster and two other guys argued with them, explaining to them why they’re wrong. Via Climate Crocks, the news that “Lord” Christopher Monckton is touring Australia to assure everyone that the fires that are visible from space are totally not caused by global warming. Tour Title: “Carbon tax, climate scam, Agenda 21: can democracy survive all three? Lord Monckton does due diligence”. Even if you cherrypick the last 16 years, it’s STILL a clear warming trend. 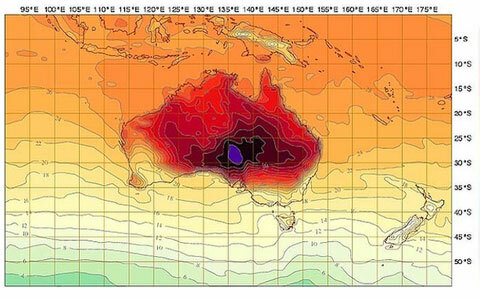 But to try to do damage control in Australia, where the Australian Board of Meteorology had to put a new color on their maps to represent the 51-54°C range… that’s chutzpah. Or dedication to your delusion. I don’t know which. Oh, and you might also be interested in the fact that arch-denialist Anthony Watts is threatening to sue Greg Laden for teaching him some science and scoffing at his crank magnetism.